Lovely Layla combines bursting pink Gerberas, Oriental Lilies and blue Iris and local greens to brighten any day and make any occasion that much more special. 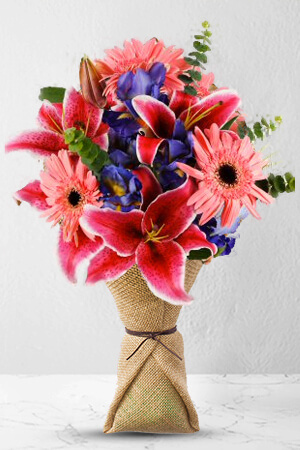 Send this gorgeous arrangement your special someone.Lilies may be sent closed/partially closed in order to prevent damage and to last longerVase not included. We would however suggest including a Premium Vase with your gift to make the it that much more lovely. My sister-in-law in Australia telephoned me in the UK to say how lovely her flowers were and also the vase that they came with, she was delighted with the selection. Had a call saying not make delivery on day, but made it anyway. Flowers are beautiful. Great volume and decent price.